Skype for iPad: Yes, It’s Now Real! Not without its launch hiccups, the much-anticipated Skype for iPad was apparently in the Apple App Store for a while last night and then disappeared accompanied by a Tweet from Skype that said: “To ensure your best Skype experience, we’ve temporarily removed Skype for iPad which went live prematurely today.” I went to the Apple App Store around 8:30 EDT this morning and found nothing. Fifteen minutes later I found an application identified as “skype software S.A.R.L.” and presto, I was able to download the Skype for iPad application. 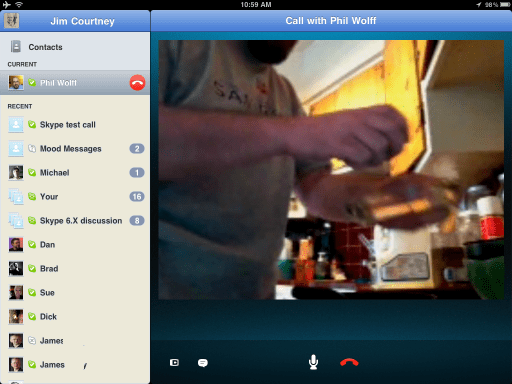 Shortly afterward Skype provided a blog post: Skype Now Optimized for your iPad. 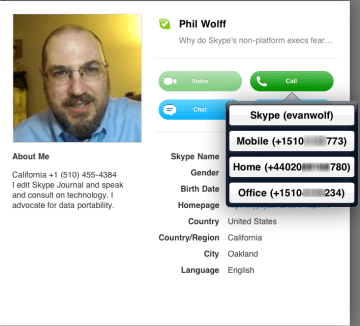 Skype Journal’s Phil Wolff, in Skype for iPad is like Skype for iPhone, with elbow room, has gone through many of the installation steps and launch features. We did an iPad 2 to iPad 1 video call this morning while he was preparing breakfast and cracking some eggs; it confirmed that you can receive a video call on an original iPad but, of course,without a camera, you can only place a voice call (or chat). 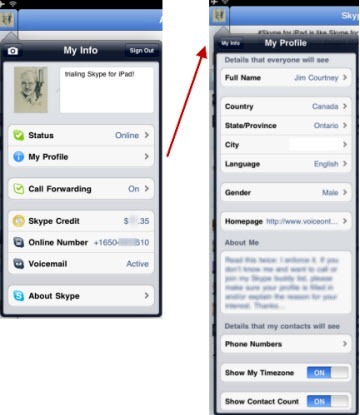 This image also provides an overview of the user interface, in landscape mode, during a call: access to the user’s Skype profile, a Contacts button, the “Current” call and a “Recent” list of Contacts with whom you have had recent chat, voice or video conversations. You can click on any of those items during a call; the call will continue with the video freezing and you can then return to the Call screen by clicking on the “Current” item (and the video goes “live” again). Tags, Categories and Groups – there’s a bit of confusion! Especially if you have been using Skype on a Windows or Mac. 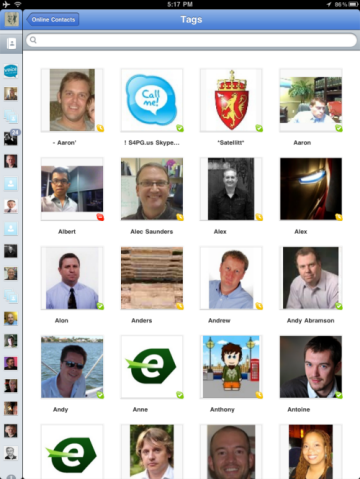 When you first launch Skype for iPad you will see an embedded “Tags” arrow in the upper left of the ribbon bar. This takes you to a page where you will see icons for “All Contacts”, “Online Contacts” and each of the “Categories” of Contacts you have created in Skype for Windows. The confusion arises through the lack of a consistent term for what are called “Categories” in Skype for Windows, “Groups” in Skype for Mac and “Tags” in Skype for iPad. Someone has to take charge as Uber-Product Manager for Skype clients and get the terminology consistent. One issue that was consistently noted by several who installed it was that, if you have a large number of Contacts, it would take some time for all the Contacts to be loaded. Also it would capture recent chat sessions that had originated on, say, Skype for Windows; I found some sessions that went back three or four days. Again this delays getting to a point where you can really start to use the application. Profile: Clicking on the Profile icon in the upper left brings up the My Info screen from which you can select “My Profile” as shown on the left. The application inherited my Call Forwarding information, Skype Credit amount and Skype Online number. The dark call screen will appear (note its similarity to the call screen in Skype for Windows 5.5), When answered, as shown above, it includes a call control bar for showing the chat session, going to a full screen display, muting the mic, a dial pad (even in a Skype-to-Skype call) and ending the call. If you select one of the Recent contacts you will see the chat session screen with a “phone” icon in the upper right; tap the phone icon to launch a call. There is no option for make multi-party calls hosted on the iPad. Voice quality during my calls today was indicative of using Skype’s SILK codec. By making a call to a Skype for Windows client I was able to confirm, via the Call Information screen in the Skype for Windows client, that Skype’s SILK codec was, in fact, deployed. At this point there is not enough experience to comment on battery drain, a significant issue with Skype for iPhone. I have also tried to make a call using a USB headset via the iPad Camera Connector; while you can hear something, it’s a very choppy audio that is not suitable for a call. On the other hand, using a 3.5mm plug headset, such as the FREETALK Handsfree, provides the crystal clear audio associated with SILK. Initially I had an issue with my iPad mic not working; however, a search on Google provided the solution: sometimes it is necessary to fully power down the iPad and reboot it to make the mic work. Bottom line: Skype for iPad takes advantage of the larger display format to manage Skype calling; however, there is a learning curve that could be enhanced through more consistency with making calls on a Windows or Mac PC (or even the iPhone). It offers outbound calling to landlines and mobile phones, it works over either 3G or WiFi, it delivers a new dimension in video calling on mobile devices (supporting both the front- and rear-facing iPad cameras), it supports instant messaging. It’s certainly a more suitable platform for video calling than the iPhone. There still needs to be some longer term experience to see how battery life will impact using Skype for iPad as an every-day “phone” and whether it can become a “default” platform for Skype calling. The processor speed on the iPad 2 vs the original iPad may also become a consideration.